Coloured contact lenses made from polymacon. Feel like a change? SofLens Natural Colors will give you the eye colour you desire! SofLens Natural Colors contact lenses are tinted soft contact lenses that can be used to intensify your natural eye colour or to change it completely. Mister Spex offers 9 different tones to choose from, and create your irresistible new look. 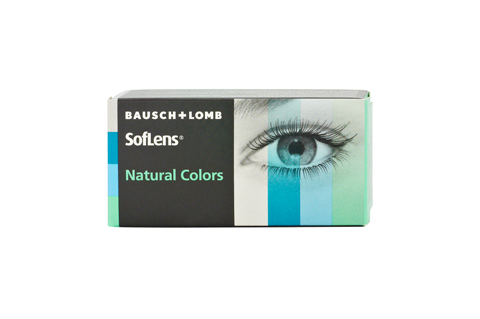 The best thing: SofLens Natural Colors are also available without a prescription! The design of SofLens Natural Colors meets the high quality standards of all SofLens contact lenses. They guarantee great comfort and care for your eyes. High oxygen permeability and a low water content provide your retina with the respiration it needs and protect your eyes against dryness. SofLens Natural Colors contact lenses do not fully conceal your natural eye colour. The resulting eye colour may, therefore, vary. Please be aware that SofLens Natural Colors can restrict vision in dark environments. The lenses should for this reason not be worn while driving. Contact lenses that do not have a prescription (non-corrective) should also be fitted by an eye doctor or optician. Find out about our unbeatable savings on multiple packs of SofLens Natural Colors and cleaning products in the Mister Spex online store. Mister Spex advises all online purchasers of SofLens Natural Colors contact lenses: the contact lenses, SofLens Natural Colors, should always be fitted to your eyes by an eye doctor or optician. The period between fittings, unless otherwise prescribed by an eye doctor or optician, should not exceed 6 months. You should go for regular check-ups. The manufacturer Bausch & Lomb/your eye doctor/optician's recommended wearing time for SofLens Natural Colors contact lenses should be followed strictly. It is your own personal responsibility to make yourself aware of the care instructions for SofLens Natural Colors contact lenses and to follow them accordingly. In case of eye irritation or visual impairments caused by SofLens Natural Colors, remove the contact lenses immediately and consult an eye doctor or optician. Damaged contact lenses should be replaced immediately.